- What kind of brush should I use for my dog? What kind of brush should I use for my dog? Getting the right brush or comb for your pet is an important first step for even the most basic home grooming. Different types of dogs require different types of brushes. Grooming helps to eliminate tangles, mats and keeps their coat’s looking vibrant and clean. It also massages and lubricates their skin which help’s to activate your pet’s natural oils and keeps pesky loose pet hair away from clothing and furniture. Although with our 2 Labradors that maybe asking a little too much! So where to start? With Bindy and Daisy its easy. We use (by we, I mean my wife) a grooming mitt, pin brush and a de-shedding tool. But different types of dogs require different types of brushes. For instance, it doesn’t make sense to use the same type of brush on a Labrador that you would use on a Poodle as their hair is very different. So which grooming brush do I use? There are five main types of dog brushes: bristle- pin- slicker- rake and the mighty mitt. Some websites say that there are only four, but we can’t forget the grooming mitt, invaluable for short haired dog brushing. Are used on short-haired, smooth-coated dogs that shed frequently. Their clusters of tightly-packed natural bristles will remove loose hair and stimulate the skin. Bristle brushes can be used on breeds such as Pugs, Italian Greyhounds, Jack Russell Terriers, and Boston Terriers. Look similar to brushes commonly used by people. They are usually oval-shaped, with a loosely-arranged set of flexible wires with pins on top. Pin brushes are the most commonly used type of brush, but often the least useful. They will pick up loose hair before it is shed onto your furniture, or finish and fluff a well-brushed coat, but provide little benefit to your pet. They are best used to finish off the grooming process. Have fine, short wires close together on a flat surface. They are used on medium-to-long-haired or curly-haired dogs to remove mats. Slicker brushes are used on many dog breeds, including Golden Retrievers, Yorkshire Terriers, Cocker Spaniels, and St. Bernards. Longer-haired dogs are more likely to develop mats which will need to be removed. These brushes designed to penetrate into a dog’s thick coat and remove tangles and dead undercoat near the dog’s skin. They are often shaped like a shaving razor and feature one or two rows of tightly-spaced pins. Like a razor, they are intended to be used with minimal pressure. Rakes should be used on thick-haired dogs including German Shepherds, Malamutes, and Chow Chows. These breeds tend to develop dead undercoats, especially during shedding season, and their thick coats also tend to trap debris. When looking for a rake, be sure to find one with pins that roughly match your dog’s hair length. Rakes that are too short will miss the inner layer of undercoat, while rakes that are too long could irritate the skin. 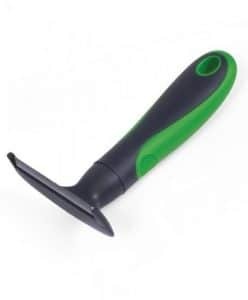 A shedding rake helps reduce topcoat and the undercoat on many dogs and cats breeds. Coat shedding can trigger allergies for people intolerance to pet hair. Regular combing with this de-shedder will greatly reduce loose or dead hair from the coat and makes your pet more comfortable, especially on those hot days. Used to remove loose hair from your dog’s coat. 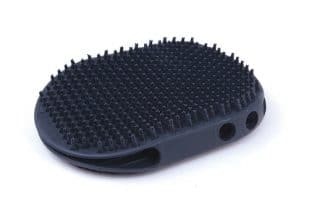 The patented rubber bristles trap hair and debris when rubbed over their coat. Ideal to massage in shampoo when washing your dog. Great for short hair breeds as you can brush both ways to mimic patting. One of our favorites! But what about dog type I hear you say? Good question. The right brush and brushing technique will depend on your dog’s hair type. Brush with the coat’s grain using a soft to medium bristle brush with short, closely spaced bristles. Brush with the coat’s grain using a slicker brush or a firm bristle brush with short, closely spaced bristles. Brush with the coat’s grain using a wire-pin brush or a soft to medium bristle brush with long, medium- to wide-spaced bristles. Use a slicker brush for mats and tangles. Brush with the grain on the outer coat and against the grain on the undercoat using a wire-pin brush or a firm bristle brush with long, wide-spaced bristles. Use a slicker brush for tangles and mats. too long could irritate the skin. Brush with and against the coat’s grain using a wire-pin brush and a soft slicker brush for tangles and mats. When brushing, be gentle and take your time. Be especially careful when removing mats or tangles. Brushing can and should be a pleasant experience for your pet as the gentle stroking feels good on your pet’s skin. It does not take too many painful ‘rips’ through snarls, however, to make brushing a procedure your pet will try to avoid rather than invite. The best way to build trust and make this a pleasurable bonding time for both of you is to brush your pet often, preferably daily. This prevents problem mats and tangles from developing. What dog brushes or combs do you use? Tell us your tips and tricks in the comments box below!